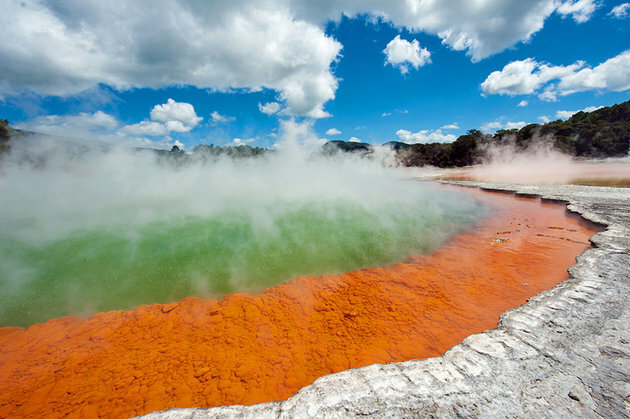 Lively Rotorua is the epicenter for viewing New Zealand's volcanic landscapes of seething, steaming geysers and mud pools. It is also an excellent base for visiting two of New Zealand's most popular tourist attractions: the glowworm caves of Waitomo and the perfectly preserved movie set of Hobbiton, left over from Peter Jackson's Lord of the Rings and Hobbit films. 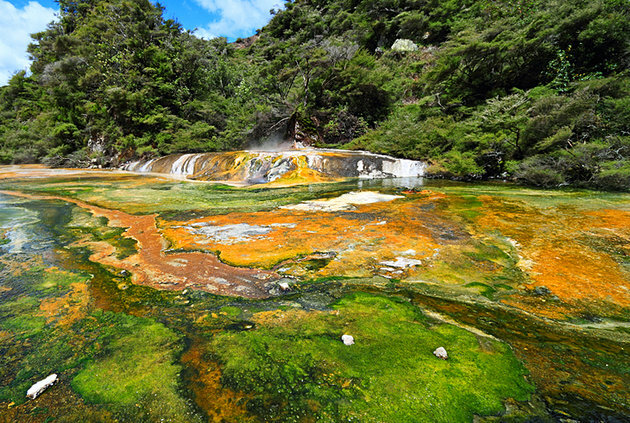 Rotorua is the heart of New Zealand's geothermal attractions, and Waimangu Volcanic Valley is one of the most popular places to see the seething mud and steaming silica terraces. 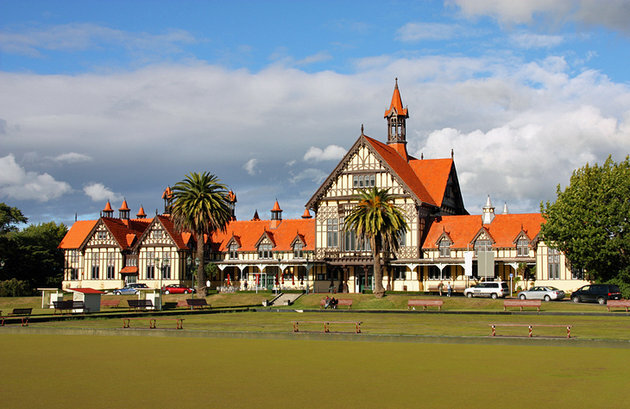 Amid the tranquil Government Gardens, which lie on the shores of Lake Rotorua, is the ornate Tudor-style Old Bath House building that now contains the Rotorua Museum. The Wairoa was envisioned as a model Maori village, which could also cater for the many foreign visitors arriving to see the famed pink and white terraces nearby. More geothermal oddities await at Wai-O-Tapu, home to the Lady Knox geyser, which erupts at 10.15 am every morning with water shooting up to 20 meters in the air. Set amid 50 acres of steaming, boiling geothermal activity, boasting the southern hemisphere's hottest waterfall and some of the most active and violently bubbling hot mud you'll see, Hells Gate Geothermal Park lives up to its name. The Waitomo Glowworm Caves are one of New Zealand's most popular sights, and for good reason. This deep limestone cave system, littered with huge stalactites, is home to hundreds of thousands of glowworms (Arachnocampa Luminosa) who illuminate the rock ceilings and walls in a spectacular display of twinkling, tiny spotlights. 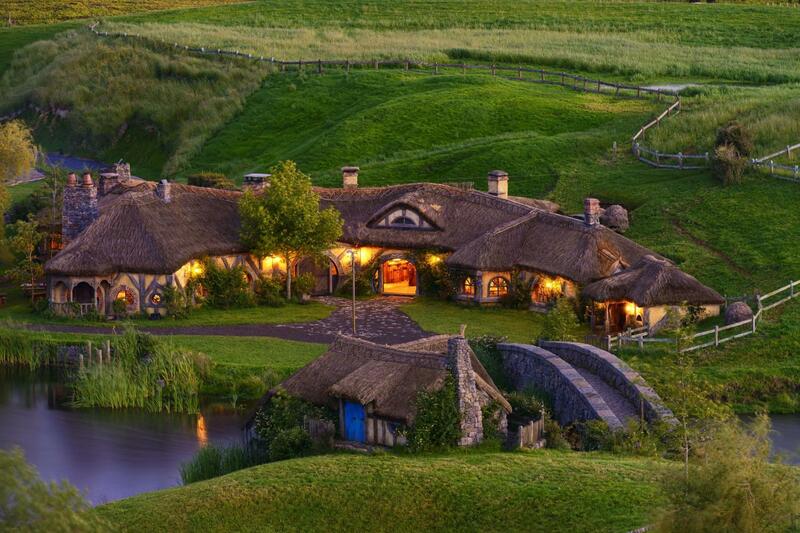 Fans of the Lord of the Rings trilogy and Hobbit films will want to make a beeline to the small town of Matamata for a pilgrimage to the film set of Hobbiton. The entire village created for the movies directed by Peter Jackson is set on the private Alexander Farm.